First Handheld GPS Navigation System with Ability to Send Text Messages Via Satellite. Highly-Anticipated Product Release is Now Widely-Available At Retail and Online. YARMOUTH, Maine -- (October 4, 2010) -- The groundbreaking new DeLorme Earthmate PN-60w with SPOT Satellite Communicator will receive a prestigious 2010 Popular Mechanics Breakthrough Award during a special ceremony Tuesday at the Hearst Publishing corporate headquarters in New York City.Combining global positioning and satellite communications technologies, this unique product pairing comprises the first handheld GPS navigation system capable of keeping users connected with family, friends and, if necessary, emergency coordination services from remote locations around the world. Popular Mechanics chose 10 products and innovators in science and technology that they believe moved society forward in 2010. 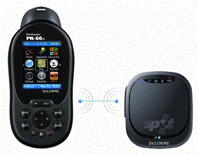 In explaining their selection, Popular Mechanics editors described the PN-60w with SPOT Satellite Communicator as “a valuable tool on any trip that extends well outside of cell phone range. It not only provides detailed topographical maps and GPS guidance in the backcountry, it also lets explorers send SOS messages with embedded coordinates via satellite if they're in trouble — or Facebook updates if they're not." A special interface on the PN-60w connects it wirelessly with the SPOT Satellite Communicator (engineered to work exclusively with the PN-60w). Custom Type & Send text messages are created on the PN-60w's internal keyboard, and sent via the SPOT Satellite Communicator to email addresses, cell phones, and or the user’s Facebook and Twitter pages. In addition, family and friends can track the user's progress via Google online maps. The other companies being recognized with Innovation Awards are Bosch, Chevrolet, GoPoint Technologies, Nissan, Qualcomm, Sony, Sprint, Stihl, and Trane. The Award winners will be highlighted in the November issue of Popular Mechanics, on newsstands Oct. 12, with winner profiles currently online at http://envelope.delorme.com/emailmarketer/link.php?M=6346407&N=326&L=401&F=H. For more information, visit http://envelope.delorme.com/emailmarketer/link.php?M=6346407&N=326&L=114&F=H. About DeLormeDeLorme is the longtime leader in innovative mapping and GPS solutions for both consumer and professional markets. Based in Yarmouth, ME, DeLorme offers a unique set of core competencies across the complex areas of map data creation and management, software development, and integration with GPS. The ability to develop all the critical components necessary to compete in the fast-changing navigation world provides a distinct competitive advantage. DeLorme is one of a handful of mapmakers that still own and produce their own content, and its Street Atlas USA, Topo North America, XMap, and Earthmate GPS products have introduced countless first-to-market innovations. To learn more, visit http://envelope.delorme.com/emailmarketer/link.php?M=6346407&N=326&L=114&F=H. About Spot LLCThe SPOT product family uses both the GPS satellite network to determine a customer's location and the SPOT network to transmit that information to friends, family or an emergency service call center. SPOT LLC, a subsidiary of Globalstar, Inc. (Nasdaq: GSAT), provides emergency notification technology that allows users to communicate from remote locations around the globe. Thanks to this affordable, cutting edge personal safety device, the company offers people peace of mind by allowing customers to notify friends and family of their location and status, and to send for emergency assistance in time of need, completely independent of cellular phone or wireless coverage. For more information on how Spot LLC is helping users live to tell about it - from disaster preparedness to outdoor adventure purposes – visit http://envelope.delorme.com/emailmarketer/link.php?M=6346407&N=326&L=402&F=H.